This valuable reference presents the “going” royalty rate for virtually any product, including over 1,500 products and services in ten lucrative categories—art, celebrity, character and entertainment, collegiate, corporate, designer, event, sports, nonprofit and music. The essential reference for both beginning and more experienced licensing professionals. 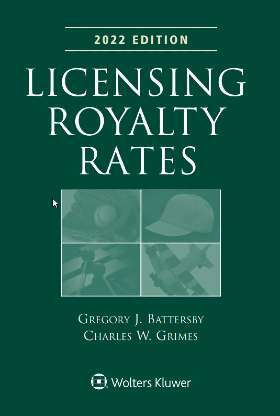 Knowing the “going” royalty rate for virtually any product is as simple as reaching for the newly published Licensing Royalty Rates, 2019 Edition . Setting a royalty rate too high can scare away potential licensees, while accepting a lower rate can cost licensors hundreds of thousands of dollars. Licensing Royalty Rates, 2019 Edition provides all the information you need to calculate the right rate every time. Royalty rate listing alphabetically by licensed product —provides a detailed alphabetical listing of products and their suggested rate range across all product categories. Royalty rate listing by international trademark class—lets you quickly identify subtle royalty rate differences between similar products within specific international trademark classes. Checklist of licensed products and services—offers a quick-reference to products with a high potential for licensing. Comprehensive list of licensed products and services—presents a detailed list of all surveyed products and services within a trademark class for preparing intent-to-use trademark applications. This detailed information gives both beginning and more experienced licensing professionals the confidence needed to negotiate the maximum allowable rate regardless of the product, the market and the parameters of the specific deal itself.